Wristwatches came into existence during the end of the 19th century, evolving from pocket watches and specifically developed as an accessory for women. Since they were specifically made for women, wearing wristwatches was obviously a big no-no for men then. Men only used pocket watches. Period. So when and how did wristwatches gained acceptance by men? Several stories behind military watch history exist but the exact fact remains unclear. A popular view has it that the German Imperial Navy were equipped with watches that could be strapped to the seamen's wrists by Girard Perregaux in 1880. Others held the view that wristwatches were first worn by the British military during the The Boer War (1899-1902) . Still others believe that Japanese soldiers were the first to wear wristwatches as an officially issued item during the Sino-Japanese War . Regardless of the different views,they share a common fact that in order to tell time with ease in the battlefields of the late 1800s, men’s pocket watches had to be modified and strapped to the soldiers' wrists for ease of use. So there’s the indisputable fact that men's wristwatches have their roots in military watches. For practical life and death reasons, men in battlefields had to wear what was considered accessory for women. Incidentally, the early 1900s advertisements of Omega mentioned that its wristwatches were used in the Anglo-Boer War not only to highlight its excellent quality but also to break through the wristwatches-are-for-women mindset. When World War I (1914-1918) broke out, many fighter planes were involved in the battles and created a heightened need for military watches. Battle operations gained sophistication and wristwatches for fighter pilots and ground soldiers became essential items. At that time, Hamilton first supplied its flagship military watch Khaki, its model name still in use and highly popular today, to the American military. Other renowned brands such as Omega and Elgin were also requested to supply their timepieces to the military. After WWI, a lifestyle of wearing wristwatches gradually gained acceptance and popularity among men, and transformed what was an essential military item into a status symbol. In the 1930s, the world was in turmoil again and heading towards another world war. By then, America had already replaced Britain as the world's number one industrial and economic superpower. The U.S. military implemented efficient and effective systems into its management and the now world renowned MIL-SPEC was born. Everything from weapons to explosives to supplies was systematically controlled and managed with very detailed and prescribed specifications, standards and quality requirements. Fulfilling the very demanding and stringent MIL-SPEC became the only route for a wristwatch to earn the right to be officially recognized and called a military watch. When talking about the history of MIL-SPEC certified military watches, one could never omit the masterpiece Type A-11. It had a distinct appearance with white hands and Arabic numeral index, black dial, 60-sec gradations and high-visibility design. It also featured the hacking function whereby the seconds hand can be stopped for exact time setting. Using this feature, soldiers could synchronize their watches with each other right down to the seconds which was very useful and important in military operations. Besides the A-11, there were other variations such as the A-17 and A-7. Collectively they were known as the Type A military watches. Production of Type A watches were carried out by several established watchmakers such as Waltham, Elgin and Bulova. Since the watches must be produced to MIL-SPEC requirements, they did not differ much in design even though the brands were different. In fact, many of the watches produced did not show the brand name on their dials at all. As one of the Allied Nations, Britain required many military watches too. However during that period, most British-established watchmakers had already shifted overseas and Britain had to rely fully on imports. The main suppliers to the British military then included Rolex , Jaeger-LeCoultre, IWC, Omega, all first-class world renowned brands. And of course, all watches supplied had to meet stringent requirements similar to the U.S. MIL-SPEC. Watches that fulfilled the demanding standards earned the right to have the British Broad Arrow engraved on the dial and case back. The models adopted by the British military then mostly featured the small seconds (seconds subdial) at the 6 o'clock position. Brands such as IWC, Jaeger LeCoultre and Omega all produced similar designs in accordance to the military standards. Threaded case backs were used and special efforts put into water proofing. Watches that met the required water proofing standard were engraved with the letters W.W.W. (waterproof wristlet watch). Germany had their own military watches too. The watch making industry already existed in the country during that period. It was said that the German military had more stringent standards than the British, and their watches produced with better design and finishing. Watches that met the German standards had the letters DH engraved on the case back. German military watches were supplied by many renowned watchmakers with A. Lange & Sohne leading the list. Unfortunately, German military watches from WWII period that are still existing today are extremely rare, compared to those of the U.S and U.K. This is probably due to a European movement to destroy everything related to the Nazis at that time. After WWII, the world commenced its recovery journey and America was heading into its best economic prosperity in history then. Strong industrial production capability and economic prosperity were strengthening America’s position as the world’s number one superpower. A key contributing factor was the Vietnam War (1955-1975). The requirement of weapons, resources and commodities was at its historical highest then. From new weapons, supplies and sundries required by soldiers to military command and control systems, every aspect required and adopted new improvements and methods. Wristwatches were no exception. The Vietnam War changed the thoughts and views about military watches which until then were considered valuable items. Disposal wristwatches were developed and adopted. It stemmed from fundamental cost-cutting measures that were implemented. Instead of collecting and repairing broken and out of order wristwatches, it was more efficient and cheaper to simply dispose them. As such, design of wristwatches was made simple. Stainless steel case was used, and glass replaced by reinforced plastic. The watches were packed in simple paper boxes and issued to soldiers together with the ration. 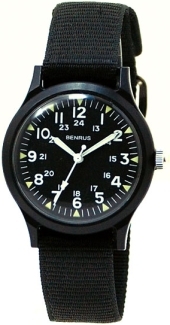 Such disposal wristwatches were supplied to the U.S. military by brands such as Benrus, Hamilton and Westronics, and all produced according to MIL-SPEC and cost-benefit calculations. It is difficult to see the evolution and development of military watches simply from their appearance. For example, the appearance of today’s customized order-made military watches do not differ much from the Type A watches of WWII. Looking from another angle, we may say that the military watches of the 1940s had already attained a very high standard. But of course, this does not mean that the evolution and development of military watches had ceased. After the Vietnam War, the most conspicuous evolution was the visibility in darkness. Soldiers had to fight in dark jungles during the Vietnam War and the ability to tell time was critical. In modern warfare, the importance of night visibility has heightened manifold since countless night operations and missions are a norm and carried out continuously. Tritium, a self-illuminating radioactive material, was used in the watch index during the Vietnam War. But despite its excellent night visibility, risks of cancer through constant exposure to tritium and fears of environmental contamination existed. Eventually, the 1989 version of MIL-SPEC prohibited the direct coating of tritium on the watch dial. Replacing Tritium (direct coating) was the self-illuminating Micro Gaseous Light developed by Swiss company MB Microtec in the 1980s. These are micro glass capsules filled with tritium gas and illuminates continuously for more than 10 years. Effect from the radioactive material is also controlled to the lowest minimum level that is harmless, and different colors developed. By fixing the micro gaseous light onto the dial and hands, safe and highly enhanced excellent visibility of the watches was achieved. 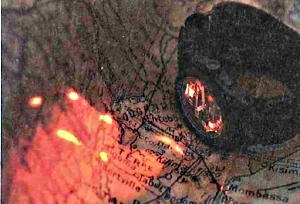 Micro Gaseous Light is now used by many military watch brands (each adopting a different name for the technology) such as Luminox, Traser and Nite. 1990s commenced with the worsening of situations in the Middle East and the First Gulf War broke out with the attack on Iraq by the U.S. By that period of time, wristwatches had already passed its maturity stage and entered a diversification era. The general markets no longer use wristwatches to only tell time. Digital watches equipped with stopwatch, calendar, alarms and various diversified functions became very popular. During the Gulf War, U.S. MIL-SPEC and military-ordered supply of wristwatches continued to exist. However, usage of military issued wristwatches was not mandatory and soldiers were able to decide to a certain degree what they wanted to wear at their discretion. One of the brands that became very popular for soldiers operating in the desert at that time was the G-Shock. It became the soldiers’ favorite with its ruggedness, quality, precision and low price. Another brand popular among the soldiers was Suunto Vector. These watches are not MIL-SPEC certified or military-ordered supplies. However, in demanding and critical situations like the warzones, there is nothing wrong in using a watch that one is already familiar with so that one can make split-second decisions and take immediate actions. In keeping pace with modern times, some MIL-SPEC certified and military-ordered watches are equipped with various value-added functions. A good example would be MTM, equipped with LED lights in the dial capable of providing different levels of illumination such as torchlight level illumination, blinking mode for signaling, soft illumination for close-up map reading, internal illumination for telling time. A century has passed since military watches were first worn by soldiers in battlefields, and have continued to attract the attention of men all over the world to this day. How military watches continue to evolve and develop in the future is certainly something military watch enthusiasts look forward to. Highly recommended and popular illustrated guide devoted specifically to military watches.